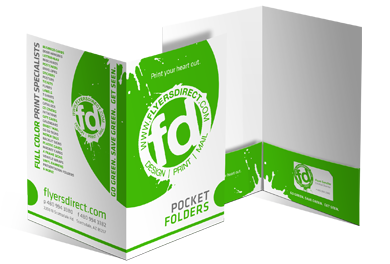 Pocket folders are extremely functional and can be produced by us quickly, affordably and in brilliant full-color. Available in a variety of sizes, on high quality paper stock, folders can be customized to include pockets and reinforced for loose materials and even die-cuts to hold business cards or inserts. We produce outstanding pocket folders for clients ranging from night clubs to non-profit groups to corporations. With superlative full-color processing, and a wide variety of printing and graphic options ranging from foiling to varnishing, your pocket folder printed by us will be an effective enhancement to your business resources.